In order to complete a booking you will need to FIT your dates WITH the above arrival days. The Booking Button cannot do this for you. The cottage is equally suitable for couples, friends or a family. It consists of five rooms on two floors - two bedrooms upstairs and a living room with dining area, kitchen and a small TV room on the ground floor. Four of the five rooms have sea views.There is a large garden with two ponds and plenty of parking space. The local area is excellent for those who enjoy the great outdoors with a good range of walks and a wide variety of birdlife. Fishing and wildlife boat trips are available and whales, seals and otters are frequently spotted. There are plenty of unusual arts and craft shops all around the island which can be tracked down with the aid of the "Gallery and StudioTrails" free booklet with some workshops also on offer. Skye is becoming known for its eating places and the famous THREE CHIMNEYS restaurant is within easy walking distance of the cottage. Live music is played in the hotels and other venues in the summer months. Portree is only 40 minutes away by car where there is a swimming pool, library and cinema in addition to a supermarket and individual shops. For those who want to go further afield Inverness and the Outer Isles are possibilities for a day's outing. All this information and more is here in the cottage for our guests plus maps, bird books, books of walks and binoculars. Gas cooker with hob, oven and grill, fridge with small freezer compartment, washing machine with dryer, microwave, toaster, sandwich maker, cafetiere, vacuum cleaner, iron and board, broom, dustpan and brush. Table cloths, table mats, coasters. Large garden overlooking sea, mountains, islands and castle. Wonderful cottage, great views. The owners could not have been more helpful. Property spacious,comfortable. Really enjoyed it. We had a wonderful family holiday (that was actually our honeymoon!) Warmly welcomed by Jasmine and the cottage had everything we needed. The views are stunning. The cottage is well situated for exploring. Would definitely recommend to anyone! We had not been to Skye in 20 years and were so happy to find this wonderful place to spend a quiet week. Jasmine and Ben were gracious hosts, providing delicious homemade scones and fishing tackle for our use in addition to a bright, clean and comfortable cottage. With two bedrooms and a TV room, a full kitchen and a washer/dryer, plenty of space to eat and read and three(!) bathrooms with showers, we had everything we needed. Our daughter flew her kite on the front lawn and we gazed endlessly across the water at the changing views in different light and weather. It was easy to get to Dunvegan (15-20 min for us slow drivers) and to Glendale and Neist Point. Portree was only 45 minutes. Plenty of hiking and places to explore. We really loved this place and will certainly return. Very special and unique. Thanks to Jasmine and Ben for a superb holiday! Lovely cottage with all the comforts of home, very well equipped and the owners were very welcoming. Amazing loch views and beautiful picture windows to view them from . Jasmine was the absolute most wonderful host. I can’t believe she could arrange the most perfect weather. Loved our stay. 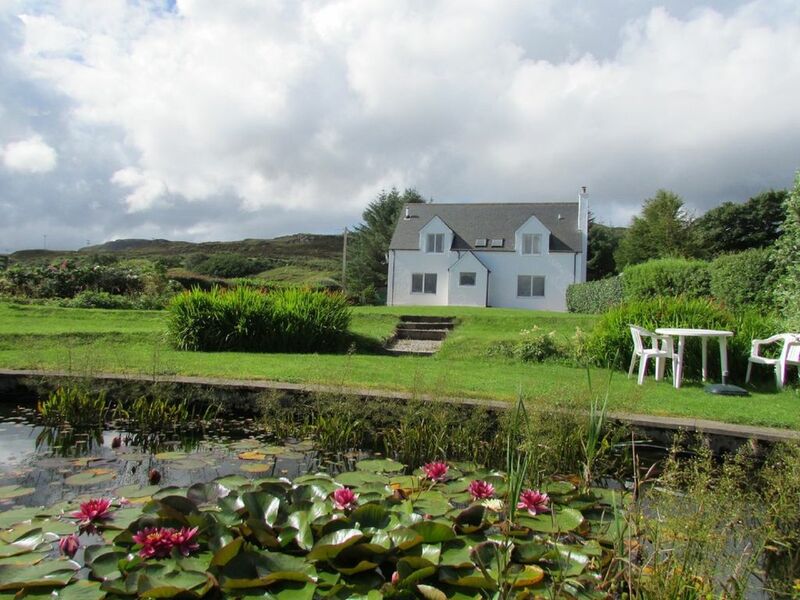 Beautiful cottage in idyllic location with lovely hosts. We chose this cottage in the Isle of Skye because it looked so beautifully located, and pictures were stunning. We were NOT disappointed. With easy access to Dunvegan and Neist Point, this cottage is ideally located, whilst also managing to be a remote getaway (exactly what we wanted for our honeymoon). The cottage was obviously decorated and looked after in a very personal and caring way, and the effort that was made to give guests information about the area was fantastic. There were print outside of local walks, maps of the area, wildlife guides... everything we might possibly need to make the most of Skye! It had the most incredible view looking out towards Dunvegan. I’m pretty sure we could see the Castle and the Coral Beach off in the distance (both easily drivable to from the cottage, along with other popular areas of the island). The facilities in the cottage were all very well looked after, and very clean. The house had three bathrooms, and the shower was the best one we had on our entire trip. Perfect after a long day of walking. Our hosts were wonderful and helpful, a real pleasure to meet and gave us great service and information in the lead up to our stay. I hope it isn’t too long before we are able to stay again!! !